Nearly three dozen Everest College students are furious they haven't received the medical certifications they paid for. The Hayward California students who attend a branch of Corinthian College refused to go to class until they get some answers. Whether they attend class or not, the students have to pay $100. Some of the students have been attending school for eight months. Three weeks ago they found out that the college does not supply them with a certificate they were told they would get, in order to obtain the medical positions they want. The students are all studying medical assisting and they paid $16,000 for an eight-month course. They were told the credits earned at the school do not transfer to any community or four-year college and that has many of them angry. Corinthian/Everest is a notorious diploma mill that preys on low-income students. It recently settled a $6.5 million lawsuit with the state of California. Now Corinthian's Haywood, California campus is in revolt. Corinthian/Everest will open a campus in Milwaukee next year. The Redevelopment Authority of Milwaukee provided it with $11 million in interest free bonds, the city's Board of Zoning Appeals approved a zoning variance to allow Corinthian/Everest to set up shop, and the Milwaukee Journal editorial Board urged BOZA approval. Is Milwaukee really so desperate that we court any investment? And what will the Journal Sentinel and the City do when Corinthian's Milwaukee students are left with mountains of debt and broken dreams? "So say I want to go out and get me a job in the medical field right now I can't. I don't have a diploma to present to them that says I've officially graduated," Everest College student Kiara Dunbar said." I graduated in December. I finished my externship in the middle of December. It is March now, you are supposed to get a diploma at least two weeks after you grad out. You have to grad out within three days or it's like you never came." "I haven't gotten a phone call to say, you know, to say it's taking a while or anything," Everest College student Nakita Dunbar said. Eduardo Hernandez was after a credential that would lead to a job and will now have to pay for another school. "It says we are not accredited by the AAMA. If you go looking for jobs in certain hospitals they will tell you right up front they will not accept anyone not accredited by the AAMA," he said. And Veronica Munson, teacher who was fired, says she was told to keep students in the dark. "Every director of education told us 'do not discuss that [accreditation] with the students," she said. After four years at the college, she was fired after taking students off campus to lunch -- a trip she says she had permission for from her supervisor. ABC7 talked to the state Medical Assistant's Education Review Board and found the Hayward Campus is one of several Everest operates in California that the board say is not accredited to credential medical assistants. In a statement to ABC7 Everest College writes: "Everest College-Hayward maintains quality standards and is accredited by the Accrediting Commission of Career Schools and Colleges (ACCC), a national accrediting agency recognized by the U.S. Department of Education." The AAMA told ABC7 that the accreditation the college mentions is one that is given to any career school or college in order to operate. It doesn't mean they can certify medical assistance. With the marathon effort to overhaul the health care system behind us, it is time for the Obama administration to move quickly and powerfully to the monumental task of putting Americans back to work. The just-say-no crowd will insist that we can’t afford a real effort to revitalize employment, that budget deficits are too high, that the economy will recover without additional government stimulus, that the president has used up most of his political capital, and that there isn’t much that government can do under any circumstances to create jobs. Meanwhile, the United States is in real danger of sinking into a long-term economic funk. The recession is not over for the nearly 15 million people who are unemployed. Many of them have been out of work for longer than six months, a seeming eternity. Widespread joblessness and underemployment are threatening to become permanent features of the American landscape, corroding not just our standards of living but the very vibrancy of the American way of life. Poverty and homelessness are increasing. More and more adult children, unable to find work, are living with their parents. The Times’s Michael Luo wrote in Monday’s paper about the increasing phenomenon of workers accepting jobs for which, in terms of their education and experience, they are considered overqualified. Those who think some kind of robust recovery is hiding around the corner, just waiting to spring a pleasant surprise on us, are deluded. Too many families and individuals are tapped out. They’re struggling from week to week and month to month just to meet the necessities of housing, food and energy costs. Those crazed, debt-driven buying sprees that held the economy aloft for so long are over. Foreclosure notices went out to 2.8 million households last year and that figure is expected to top 3 million this year. Nearly 1 in every 4 homes with mortgages is “underwater,” which means that the mortgage holder owes more on the property than it is worth. You can’t get back to a robust economy without putting Americans back to work. The economy needs to be rebuilt on a solid foundation of good jobs at good pay, and many of those jobs will have to come from thriving new industries. This is a long-term project that demands big-time government involvement. It will require the kind of commitment — over an even longer period of time — that President Obama and the Democrats in Congress gave to their health care initiative. The administration and Congressional leaders have been touting some recent legislation as “jobs bills,” but they are small-bore initiatives that will accomplish little. What is needed are bold new initiatives on several fronts. The federal government needs to do much more to help state and local governments that are in desperate fiscal straits because of falling tax revenues and are responding by laying off workers and cutting essential services. A long-term program to rebuild the nation’s infrastructure (which was only made worse by the harsh winter) would create jobs and establish a sound industrial platform for 21st-century industries. The transformation to a greener economy needs to be accelerated, and most of the manufacturing associated with that newer, greener economy should take place in the United States. And some new variation of the Works Progress Administration and the Civilian Conservation Corps should be developed to put economically distressed young people to work. What is happening to young, out-of-work and poorly educated American kids — not just in the big cities, but increasingly in suburban and rural areas, as well — is tragic. The United States is a rich nation. To say that we cannot afford to do the things necessary to shore up the quality of our lives and establish a brighter future for coming generations is absurd. We always seem to have money for warfare and to bolster the interests of the monied classes. As for the budget deficits, they will never be brought under control if Americans are not put back to work. Unemployment drives deficits by depriving the government of tax revenues and dramatically increasing the costs of safety-net programs and other public services. Putting Americans to work will ultimately make it much easier to begin bringing the deficits down. The closest thing to a magic potion for individuals, families and the American economy is a job. F.D.R. understood that. The longer it takes for the rest of us to catch on, the deeper the long-term damage to the society will be. the answer to corporate power is organized people. Bill Moyers writes: the only answer to organized money is organized people. That would be one hell of a reformation. Read his essay on how well-heeled lobbyists for the insurance companies and banks are undermining needed reforms. The essay is linked here. The Republican Party and its Tea Party followers have responded to the new health care law with venomous attacks, including racist taunting of Congressmen and attacks on Congressmen's homes. This is profoundly disturbing because their over-the-top rhetoric creates a climate where violent acts are justified, One of the bricks thrown through a Congressman's window read:"extremism in the defense of liberty is no vice." In opposing legislation that provides health insurance to 31 million Americans, the Republican Party leadership is continuing its tradition of opposing any effort to create a more just and secure society for working men and women. Not long ago it opposed Social Security, Medicare, Medicaid and the Voting Rights Act. The Republican Party, the Dixiecrats who have now joined their ranks and the violent fanatics they inspire are the descendants of right-wing night riders and the Klan vigilantes who not long ago firebombed homes and churches and lynched men and women who wanted the United States to live up to its promise that "all men are created equal...."
His column is worth reading and is linked here. Do Republicans really want to campaign in favor of insurance companies’ right to drop people when they get sick? Do they really want to knock the 25-year-old graduate student, living on Top Ramen and hope, off his parents’ health care? Are they going to deny tax credits for small businesses? It was the ancient Greeks who gave us a sense of what Republicans will be living with under this pact with rage. Many people are afraid of the dark, the saying goes. But the real tragedy is those who are afraid of the light. His column is also linked. Before the Legislature recesses, it ought to help Wisconsin's low-wage workers by fixing the state's minimum wage law by indexing it to the rate of inflation. The state minimum wage was raised from $6.50 to $7.25 in July 2009 when the federal minimum wage was increased. Like the national, it can only be increased through legislative action. As a result, increases are far and few between. In the years when the legislature fails to act, the minimum wage quickly loses value (purchasing power) as prices rise. While the costs of health care, gasoline and education have soared, the minimum wage has declined in value. Currently, it is worth 10% less than it was in 1979. The solution is simple: raise the state's minimum wage and index it to the cost of living. This will ensure that the state’s more than 300,000 low-wage workers' real wages don't decline just because the legislature fails to act. And fail it has. The state last increased its minimum wage five years ago in 2005 and that was the first increase in 7 years. So in 12 years Wisconsin legislators have increased the minimum wage only two times. During that time their own salaries have been increased six times totaling almost $11,000. It's not as if indexing is a radical idea. In 1972 when Republican Richard Nixon was President, the United States Congress indexed Social Security to the CPI to insure that the nation's retirees and disabled weren't thrown into poverty simply because prices increased. This simple act rescued tens of millions from poverty. The elderly are no longer America's largest impoverished group. Raising the minimum wage and indexing it to the cost of living will reduce inequality and increase productivity. Until the 1980s, bottom rung jobs were valuable because the minimum wage was raised frequently enough to be an effective wage floor. Regular increases also raised the pay of workers whose wages were several rungs above the minimum and consequently reduced employee turn-over. Employers, forced to value their low-end workers, offered them training and advancement that led to increased productivity. Everybody benefited. Ten states have already indexed their minimum wage to the cost of living. Twelve have increased their minimum wage above the national. None experienced the decline in employment that opponents of raising the minimum wage predict. 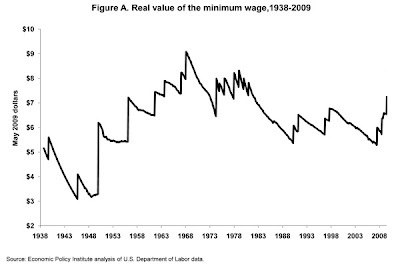 Critics opposed to raising the minimum wage use simple supply and demand theory to argue that an increase in the minimum wage (the price of labor) will reduce jobs ( the quantity of labor demanded) and increase competition for the jobs (the quantity of labor supplied) hurting the very low paid workers we are trying to help. But studies of states that actually raised the minimum wage in the early 1990s (when the real minimum wage was falling) by economists David Card and Alan Kreuger found no increase in unemployment. There is a simple explanation for these findings. Most firms paying the minimum wage are large national retail and fast-food chains like Wal-Mart and McDonald’s, not the ubiquitous mom and pop stores of 1950’s main street. These firms make staffing decisions based on how many employees they need to efficiently serve their customers at any given time, not on marginal increases in the price of labor. The incremental increases in wages that result from indexing are absorbed through marginal price increases and or increased productivity. Some say now is not the right time to address this problem. But if it wasn't right to index the minimum wage to the C.P.I when the economy was booming and it isn't right to raise it now, when will the time be right? It is important to raise the minimum wage and index it now because Wisconsin is mired in what is at best a jobless recovery that will rob low-wage workers of the bargaining power they need to negotiate fair wages for their labor for the foreseeable future. The Wisconsin Senate has already passed a bill, SB-1 that raises the state's minimum wage to $7.60 an hour and indexes it to the cost of living. It would help 316,000 Wisconsin workers, those paid the minimum and those whose wages are anchored by it. There is a companion Assembly Bill, AB-41, but it has been stalled in committee. What is the Assembly waiting for? The House has passed the Senate version of health reform, and an improved version will be achieved through reconciliation. It simply makes no sense to cast adrift illegal immigrant students whom we have invested so much to educate from kindergarten through 12th grade. The entire editorial is linked here. California has been very, very good to Toyota. It is one of the largest markets in the world for the popular Prius hybrid. Nearly 18 percent of all Toyotas sold in the U.S. are sold in California. The state has showered the company with benefits, including large-scale infrastructure improvements for its operations and millions of dollars for worker training. California is one of the key reasons that Toyota is the wealthiest carmaker on the planet. Toyota is paying the state back with the foulest form of ingratitude. The company is planning to shut down the assembly plant in Fremont, Calif., that makes Corollas and the Tacoma compact pickup. The plant closure will throw 4,700 experienced, highly skilled and dedicated employees onto the street during the worst job market since the Depression, and it will jeopardize nearly 20,000 other jobs around the state. What we’re dealing with here is the kind of corporate treachery toward workers and their local communities that has ruined countless lives over the past several decades and completely undermined the long-term prospects of the economy. .. The company could keep the plant open and profitable if it wanted to. But, instead, it has decided to shift the production of these vehicles to Japan, Canada, Mexico and Texas. The entire story is linked. A month ago, the Milwaukee Board of Zoning Appeals (BOZA) approved a zoning variance that allows Corinthian College, a diploma mill with a notorious record of exploiting students, to establish operations directly on the dorrstep of Milwaukee Area Technical College (MATC) and the Hillside Housing Project. The change was opposed by a broad coalition including the Hillside Residents Council, Millele Coggs, the area's alderwomen, five other aldermen, the NAACP, Voces del la Frontera, MATC's Latino Student Organization, Good Jobs and Livable Neighborhoods, and the American Federation of Teachers Local 212. After a critical article and skeptical editorial appeared in the Milwaukee Journal Senetinel, Corithian hired Milwaukee PR flak Evan Zeppos to make its case. Zeppos enlisted the Metropolitan Milwaukee Chamber of Commerce's Tim Sheeehy. Sheehy's support was apparently all that was need to convince the MJS editorial board to support Corinthian. In a particularly cynical editorial, the editorial board urged BOZA to support Corinthian's efforts as a simple "land use issue"..."that could provide a boost to development in the adjacent Park East Corridor." It cautioned; "...the school must guard against being seen as an institution that preys on rather then helps young urban students..."
The editorial board's position is inane because Corinthian's problem is not about perception or public relations. It is an institution that PREYS on young urban students. It's student default rate is is 250% of the national average for all higher education institutions, and 140% of the national average 3-Year Student Loan Default Rate at for-profit institutions. These startling results are the direct result of Corinthian's record of manipulating and exploiting students that has generated lawsuits, negative publicity and investigations including a recent $6.5 million settlement with the state of California. Its business plan is based on luring low income people to take out guaranteed federal loans that they have no reasonable chance of repaying. In a recent call with investors and analysts, Corinthian Colleges, Inc. said it fully expects a shocking 56 to 58 percent of the borrowers to default. Yet they consider these loans good investments because they will increase enrollment and with it a profitable flow of federal grant and loan dollars that outweighs the planned writeoff. While several other Alderman vocally opposed the development, the Department of City Development (DCD) originally championed it and the Mayor failed to use his influence to derail it. When the final vote was taken several members of BOZA cited the city's support for the development as the reason for their affirmative vote. Corinthian is in the sub-prime student loan business. It preys on students dreams for a better life and leaves them with nothing but mountains of debt. That is why the investor magazine Barron's, described Corinthian as a "high-pressure sales operations bent on vacuuming up student-loan dollars." It is unconscionable that the Milwaukee top elected officials are assisting an unsavory business with as dismal a record as Corinthian's. Is DCD really so desperate for investment that it will support any development no matter how exploitative? Their ...profits have come at substantial taxpayer expense while often delivering dubious benefits to students...Critics say many schools exaggerate the value of their degree programs, selling young people on dreams of middle-class wages while setting them up for default on untenable debts, low-wage work and a struggle to avoid poverty. And the schools are harvesting growing federal student aid dollars, including Pell grants awarded to low-income students. “If these programs keep growing, you’re going to wind up with more and more students who are graduating and can’t find meaningful employment,” said Rafael I. Pardo, a professor at Seattle University School of Law and an expert on educational finance. “They can’t generate income needed to pay back their loans, and they’re going to end up in financial distress.” these schools have exploited the recession as a lucrative recruiting device while tapping a larger pool of federal student aid." Wyotech, a Corinthian's subsidiary,is highlighted in the article: "
Jeffrey West was working at a pet store near Philadelphia, earning about $8 an hour, when he saw advertisements for training programs offered by WyoTech, a chain of trade schools owned by Corinthian Colleges Inc., a publicly traded company that last year reported revenue of $1.3 billion. After Mr. West called the school, an admissions representative drove to his house to sell him on classes in auto body refinishing and upholstering technology, a nine-month program that cost about $30,000. Mr. West blanched at the tuition, he recalled, but the representative assured him the program amounted to an antidote to hard economic times. Some 14 months after he completed the program, Mr. West, 21, has failed to find an automotive job. He is working for $12 an hour weatherizing foreclosed houses. With loan payments reaching $600 a month, he is working six and seven days a week to keep up. Corinthian is coming to Milwaukee to prey on Milwaukee's urban students at the invitation of a local developer and with the apparent blessing of DCD, the Mayor's office and the Journal Sentinel editorial board. When their ex-students end up with broken dreams and mountains of debt will City Hall and the Journal Sentinel editorial board be there to help pick up the pieces? For weeks, Congressman Paul Ryan has been praised for being innovative, responsible and even courageous for his analysis of the nation's fiscal problems. Nobel Prize winning economist Paul Krugman has a more critical view writing that the Ryan's Roadmap wouldn't balance the budget, but would provide a windfall to the wealthiest Americans while privatizing Social Security. We've seen these kind of Robin Hood of the Rich policies before and they are hardly courageous. They might not help main street, but they are sure to please Goldman Sachs. Naturally, Ryan’s response to these revelations has been a hissy fit. The Center on Budget and Policy Priorities — which has always, in my experience, been impeccably honest and careful in its work — does the point by point rebuttal. But I’d like to follow up on small but revealing point: Ryan’s claim that diverting a substantial share of payroll taxes receipts into individual accounts does not constitute partial privatization of Social Security You see, there’s a history here. Back when the Cato Institute first began pushing for individual Social Security accounts, it called its push, well, The Project on Social Security Privatization. As the Bush administration got ready to make its privatization push, however, it became clear that “privatization” polled badly. So the project was renamed The Project on Social Security Choice. And Republicans began bristling at any suggestions that they were proposing privatization, calling that a slander. Really. Wait, it gets better. Cato engaged in Orwellian tactics — deleting the term “privatization” from older web posts and even from records of old conferences. But they were sloppy; there were traces of the true history throughout. I don’t know if they’re still continuing the practice. In any case, Ryan’s attempt to deny that what his own movement used to call privatization is, in fact, privatization should settle the question of his sincerity. Without question, his was the most impressive record on civil rights and equality of any president from Lincoln to Lyndon B. Johnson. As Treasury Secretary, Robert Rubin put in place all the pieces that set up the economy for the disaster that we are now living through. He pushed legislation that weakened regulation of the financial sector; he cheered on a stock bubble that eventually grew to $10 trillion and he established an over-valued dollar as a matter of official policy. He then left to take a top job at Citigroup where he was able to enjoy the fruits of his labor. He earned well over $100 million in the decade after he left the Clinton administration. In the fall of 2008, when Citigroup was saved from bankruptcy with a taxpayer bailout, Rubin quietly slipped out the back door (with his money), resigning from his position at Citigroup. It may not seem just that someone like Rubin would be allowed to live out his life in luxury after the policies that he promoted and personally profited from led to so much suffering for so many people. But that is the way things work in the United States these days. However, what is even more infuriating is that he doesn't seem to have any intention of going away. He is still pontificating on the economy and desperately trying to rewrite history to exonerate himself. Who will clean up after Corinthian College? A month ago, the Milwaukee Board of Zoning Appeals (BOZA) approved a zoning variance that allows Corinthian College, a diploma mill with a notorious record of exploiting students, to establish operations directly across the street from Milwaukee Area Technical College (MATC) and on the doorstep of the Hillside Housing Project. Whatever happened to their responsibility to serve and protect the public? Is DCD really so desperate for investment that they will support any development no matter how exploitative? The nation lost another 36,000 jobs last month bringing the total job loss to 8.4 million jobs since the recession began. More than 15 million Americans are officially unemployed! Forty percent of the unemployed have been without work for more than six months. If we include those working part-time because they cannot find full-time employment and those who have given up looking for work (discouraged workers) 29 million (16.8%) are either unemployed or unemployed. And that's only part of the story. We are short another 2.7 million jobs, positions that are needed to absorb the 100,000 workers entering the labor market every month. Last week Republican Senator Jim Bunning, who lost his fastball years ago, held up 100,000 Americans' unemployment checks because he claimed to be concerned about the growing federal deficit. There are more than six unemployed workers for every job opening and the number of long- term unemployed is greater than at any time since the Great Depression. Yet Kyl feigns concern that extending unemployment benefits discourages people from working. This is truly amazing! Republicans like Bunning and Wisconsin's own Paul Ryan, and moderate Democrats helped create the nation's river of red ink by supporting President Bush's $1.8 trillion high income tax cuts and the trillion dollar invasion of Iraq. Now they in the name of fiscal responsibility they want to ignore the more pressing 11.1 million jobs deficit. To fill that hole, while keeping up with a growing work force, requires the creation of more than 400,000 new jobs a month for three years — wildly in excess of even the most optimistic projections. America's working people and their families are hurting and no one in Washington DC or Madison seem to be listening. I’ve talked with employers and small business owners in Milwaukee, and they resoundingly told me that the tax credits in this bill will not help them hire new people. What they need are customers – customers with money to spend. And customers need jobs. Job creating legislation needs to be targeted to areas with persistent unemployment like we have in Milwaukee, and I’ve been advocating to make sure that we focus on the areas that need it most. This bill does exactly the opposite. I am working with my colleagues to make sure that no one forgets about the folks in communities where unemployment is more than double the national average. A jobs bill needs to actually create jobs. The nation needs a real jobs bill that includes an extension of unemployment benefits which account for only 0.07% of the GDP and direct aid to state and local governments. Extending unemployment benefits is not only the right thing to do for people who are unemployed through not fault of their own, but it is one of the best forms of economic stimulus because the money will be immediately spent. Without increased federal aid to the states and local governments, they will be forced to slash their spending and lay-off even more workers, including firefighters, police officers, other first responders and teachers, further depressing consumption and private sector growth driven by government purchases. The Wisconsin Legislature has also done very little to address the state's job gap. At a minimum it ought to help low-wage and part-time workers by passing an increase in the state's minimum wage which it has been sitting on for over a year. A jobs bill should, as Moore said, create jobs. There is important work that needs to be done in this country, rebuilding the deteriorating infrastructure of roads, bridges, levees, parks, urban water system, and schools, and there are unemployed workers who want to work! Public investments like these would not only put people back to work, but lay the basis for long term economic growth. What are our elected officials waiting for? When politicians say they are focused on jobs, jobs, jobs they should mean more than their own. The Milwaukee Journal Sentinel circulation must really be down, or its editors have a pathological hatred of the American Recovery and Reinvestemnt Act. There are no other possible explanations for its sensationalist, above the fold, front page article about the failure of the Milwaukee Area Technical College (MATC) and four other stimulus fund recipients to meet a reporting deadline. That’s right, the Journal Sentinel thought missing a deadline merited front page and distorted coverage. Sure, MATC’s administration needs to tighten up its reporting procedures, but its failure to meet a deadline on money it has not even received hardly constitutes front page news. If only MATC had received millions of federal dollars, it wouldn’t be struggling to meet the huge increase in demand for its services. The real scandal that merits front page coverage is that MATC’s enrollments have soared as Iraqi veterans and dislocated workers seek occupational training, but state aid to the tech college system has fallen to 13%, the lowest level in history and way below the state’s 33% commitment. And while President Obama has proposed a significant increase in federal support for two-year colleges, Congress has yet to approve the needed funding while the GOP appears committed to opposing absolutely everything Obama wants. Rather than manufacturing imaginary scandals, the Journal Sentinel should use its bully pulpit to demand that the federal government increase its investments in higher education. The local newspaper apparently has an axe to grind with the stimulus program. A month ago in a front page article entitled "Economists see no stimulus jobs" it incorrectly claimed that the American Recovery and Reinvestment Act had not created any jobs, an assertion that virtually no economist agrees with. Now it implies that the program is acting irresponsibly. The only institution that is behaving irresponsibly is the Milwaukee Journal Sentinel which in its desperate effort to increase sales, has, in the words of Steven Colbert, a truthiness problem. The year before the Great Recession, Mercury Marine and its union settled on a new contract indicating that their business model, including the negotiated wage and benefit structure, worked. Once the recession hit, the demand for Mercury's discretionary product, outboard motors, plummeted. In past recessions when sales declined, firms laid off their hourly employees until demand picked up. The national unemployment compensation system is designed precisely for such circumstances. It provides the unemployed worker with a weekly check and saves companies money by ensuring their skilled and experienced labor force will return when the economy begins to grow again. Mercury cynically used the Great Recession to restructure its labor costs and externalize its costs. It whipsawed the Fond du Lac plant against an offer from right-to-work Oklahoma demanding concessions including a 40% wage cut. The local union that represents the hourly employees initially stood up to Mercury's naked money grab, but under pressure from community and political leaders eventually agreed to the significant concessions. Mercury's threat to relocate also got the state, Fond du Lac County and the City of Fond du Lac to pony up almost $125 million, $50 million of which will be generated by an increase in the county's sale tax. Now Mercury Marine is handing out bonuses to all its non-union folks. The Wall Street ethos has come to Main Street. As union president Mark Zillges says: "Fifty years worth of benefits they took away from these people in one swoop. Now they give themselves bonuses. That's the biggest slap to these people there is...This is not right. It's not right for these people to get rich off the sweat of these other people who just lost it."